rv-pro.com November 2018 • RV PRO • 51 finish and 31-inch off-road tires. It features a unique multi-tent system. 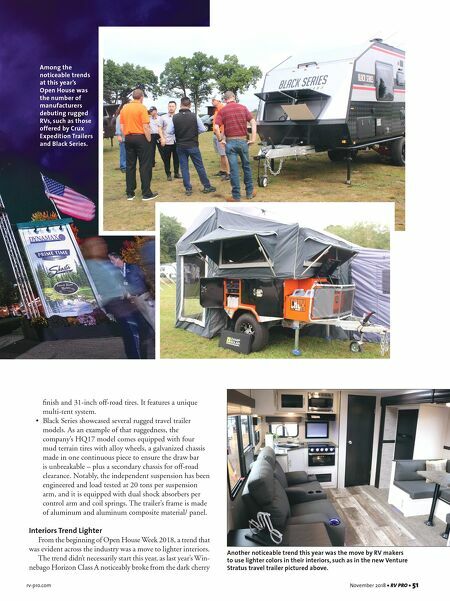 • Black Series showcased several rugged travel trailer models. As an example of that ruggedness, the company's HQ17 model comes equipped with four mud terrain tires with alloy wheels, a galvanized chassis made in one continuous piece to ensure the draw bar is unbreakable – plus a secondary chassis for off-road clearance. Notably, the independent suspension has been engineered and load tested at 20 tons per suspension arm, and it is equipped with dual shock absorbers per control arm and coil springs. The trailer's frame is made of aluminum and aluminum composite material/ panel. Interiors Trend Lighter From the beginning of Open House Week 2018, a trend that was evident across the industry was a move to lighter interiors. The trend didn't necessarily start this year, as last year's Win- nebago Horizon Class A noticeably broke from the dark cherry Another noticeable trend this year was the move by RV makers to use lighter colors in their interiors, such as in the new Venture Stratus travel trailer pictured above. 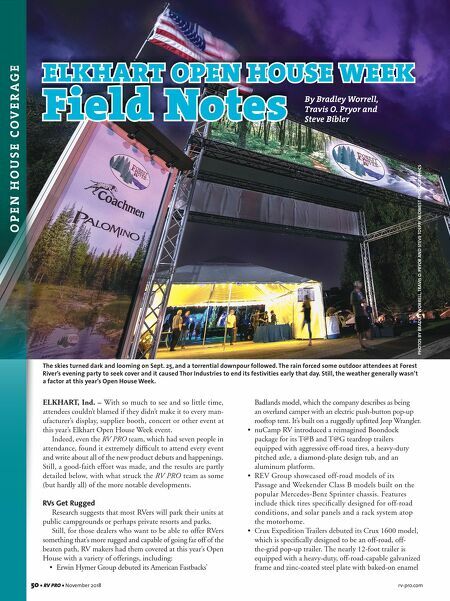 Among the noticeable trends at this year's Open House was the number of manufacturers debuting rugged RVs, such as those offered by Crux Expedition Trailers and Black Series.